LESSON 3: Inquiry with Mixed Numbers - How far did she run? SWBAT review and use fraction concepts via a computer game. In this lesson, students log into a free computer program in which they practice fourth grade fraction concepts and skills. Explain why a fraction a/b is equivalent to a fraction (n Ã a)/(n Ã b) by using visual fraction models, with attention to how the number and size of the parts differ even though the two fractions themselves are the same size. Use this principle to recognize and generate equivalent fractions. Understand a fraction a/b as a multiple of 1/b. For example, use a visual fraction model to represent 5/4 as the product 5 Ã (1/4), recording the conclusion by the equation 5/4 = 5 Ã (1/4). Time for Each Student Today! This lesson allows students to practice procedural knowledge in a fun interactive way. Procedural fluency is important for knowledge to eventually become automatic. For procedural fluency to develop, it must be practiced. In this lesson students practice procedural fluency by using a computer program called Sumdog. Sumdog is a way for students to practice math skills while playing fun, math-related games against friends, classmates, or students from around the world. Games are individualized for each kid's ability level, so users can play against opponents who have the same skills. It's free, but a subscription to Sumdog Premium provides more games and more detailed feedback. I LOVE this short video. It truly shows how excited my students get about SumDog. The girl in the middle is begging me about using the computers to play SumDog. She does get up very quickly when she realizes I am videoing her, but I love how true her emotions are in this very short clip. As a teacher, I can register myself and my students for free. (There is a more souped-up version which requires a school subscription and offers more bells and whistles, but for my classroom, I use the free version. Once students log in, they can select which challenge they’d like to complete, and they decide which game they’d like to play. Before deciding which game they want to play, I have students set their skills to fraction concepts. One of my favorite aspects of the Sumdog program is that it allows me to direct students which skills to target. This is also helpful for differentiation. If a student needed more time and practice in a skill, he or she can set those skills and still play the exact same games the other students are playing. SumDog offers 12 free game formats, including Football Touchdown, Street Racing, Bunny Hop, Canal Cleanup, Pop Tune (think American Idol), etc. This photo shows a screen shot of one of the SumDog games. I believe that technology motivates students. It’s also no secret that students love to fill their free time by playing computer and video games. SumDog combines the best of both worlds. 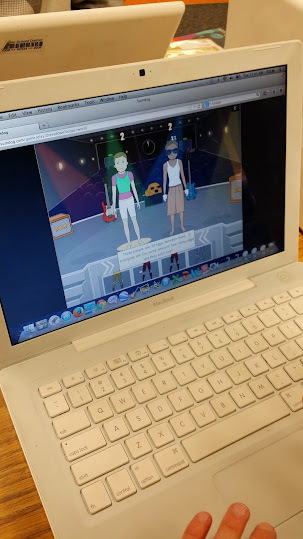 Students are engaged and motivated to play SumDog’s many computer games, and are also practicing important math skills in order to gain procedural fluency. Listen in as I capture these girls excitedly getting ready to play SumDog. Notice how surprised they are when I ask them a question. They were so involved in the computer that they didn't even know I was there.